No other room in the home is remodeled more often than the bathroom. If you're looking at a bathroom remodeling project you are probably looking at tile flooring options. Tile is indeed a great choice for the bathroom - water resistant, easy to clean and with lots of design options. But what if you want to do something just a little different? 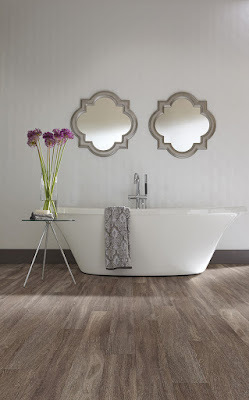 What if you want a wood or stone floor in your bathroom? Not practical, right? Luxury vinyl tile brings those looks within reach (and within budget). Luxury vinyl tile - also called resilient flooring - is a new generation of vinyl flooring. Two key things make it different from traditional vinyl floors. First, new manufacturing techniques allow designers to craft a top layer with the accurate appearance of many different types of wood or stone. Second, luxury vinyl is installed in tiles or planks furthering the appearance of the wood or stone that it is designed to mimic. In fact, many luxury vinyl floors even have a texture to them - it's truly hard to tell the difference between a luxury vinyl floor and a traditional wood or stone floor. 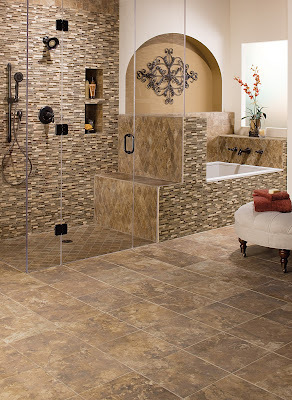 Why should you consider luxury vinyl tile in your bathroom? In a nutshell because it brings all the practical benefits of vinyl while opening up a whole new range of design options for your bathroom remodeling project. This is a floor you have to see for yourself. Visit our luxury vinyl flooring showroom on the north side of Indianapolis and ask to see our wide selection of luxury vinyl flooring. We carry luxury vinyl from Armstrong, Gilford-Johnson, Mannington, Mohawk, Shaw Floors and US Floors. Our flooring design experts can help you find the best floor for your bathroom (or any room of the house).